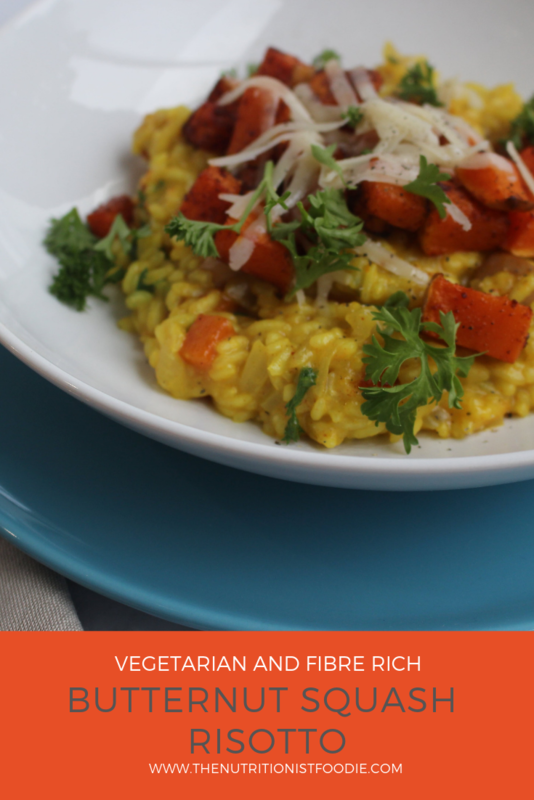 Try out this delicious and nutritious vegetarian and high in fibre recipe when you have a little bit more time over the weekend. Cut up the butternut squash into cubes. You will need about half the squash for this recipe but I usually dice the entire thing and roast all of it. The remainder of it can then be used for lunches during the week. You could also use it for a soup or freeze the other half raw and use it at another point. Put the butternut squash into the freezer bag along with a little bit of olive oil and all your spices (except the turmeric). Mix it well together and ensure all the butternut squash is well covered in spices. Make some vegetable stock. You will need just under a litre of stock. Heat a small amount of oil in a pan..this will need to be big enough to fit your rice. Keep the stock beside your pan with a ladle. Once the butternut squash is cooked add half of it to the risotto and put the other half on top. Dress with the parsley and the rest of the parmesan cheese/nutritional yeast. Do you like this recipe? Would you like to save it so you can try it out later? Pin the below image to save it to your Pinterest account.